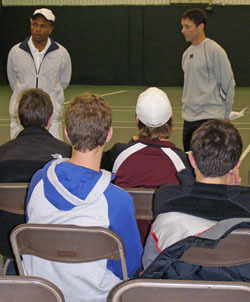 The 12th Annual National Junior Tennis Conference & Training Camp was one of the most successful as a multitude of parents, players and coaches gathered at the Libertyville and Lincolnshire Clubs in the suburbs of Chicago. 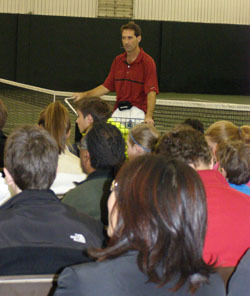 CARE Academy Director Mark Bey brings together experts in all facets of junior tennis for this annual three day event. 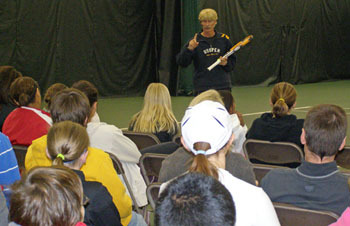 This year's speakers included developmental coaches Peter Cameron, Ken DeHart, Elliott McDermed and Steve Smith; USTA representatives Andrea Calvert (Director of Junior Tennis for the Midwest section), Janice Lumpkin (USTA Certified Official) and Mark Kovacs (National Player Development Manager, Sports Science); College Coaches Bruce Berque (Michigan), Brian Fleischman (Wisconsin), George Husack (Illinois), Jay Louderback (Notre Dame) and Billy Pate (Alabama); and Loyola University Medical Center;s Neeru Jayanthi, MD. 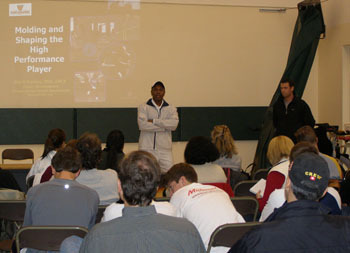 Jeff Greenwald -- pictured right -- author of Mental Edge, who told a large audience about Managing the Mind during Competition. 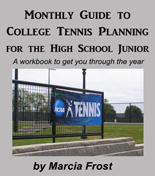 Coach Mark Bey was not only the organizer of the event, but he participated in many of the sessions and led parents and players through the seminars, as well as the training focused to get juniors ready for upcoming national play at Eddie Herr and National Opens. 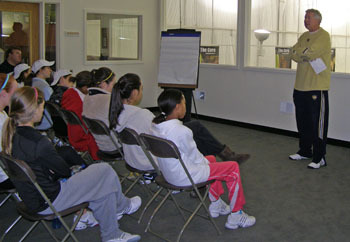 Mark Kovacs told parents about "Molding and Shaping the High Performance Player for Competition"